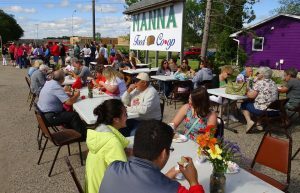 MANNA Food Co-op’s grand opening this Saturday, October 7 from 3-5 pm will feature food, family, and fun to celebrate reaching our goal of 500 member-owners and officially opening. The MANNA board and staff have been hard at work getting the co-op started. We have been doing a soft opening since the end of August, testing and setting up our systems. We feel we are now ready to go prime time and host our grand opening. Please come for live music with Dan Thornby and friends, food samples from our local and organic vendors, and a chance to check out the store.